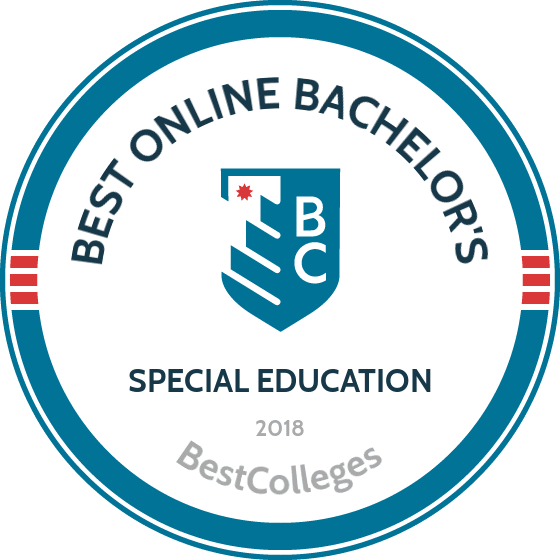 WHAT ARE THE BEST ONLINE BACHELOR'S IN SPECIAL EDUCATION PROGRAMS? What Else can I Expect from an Online Bachelor's in Special Education Program? What Can I Do With a Bachelor's in Special Education Degree? The special education field is rewarding and fulfilling, and an online degree in special education leads to a career that is challenging and fosters personal growth. The U.S. Bureau of Labor Statistics reports that special education teachers held 450,700 jobs in 2014, and the field is still growing. Special education professionals work with students who have mental and physical disabilities. There is a growing need in the education system for assistance and guidance for special needs students, making a bachelor's degree in special education exceptionally marketable and useful. Below, we'll discuss how to choose the best online bachelor's in special education program for you. Bachelor's in special education programs often provide options for tailoring the curriculum to your specific career goals. Explore all the options within each potential program. Here are a few aspects to consider when researching online bachelor's in special education programs. Internships and field experience: Gaining field experience while earning a degree in education equips graduates with knowledge and skills, along with semesters or years of experience to pad your résumé. Look for programs with built-in fieldwork or internships. Concentrations: Programs often offer focuses of study. In special education, pursuing these concentrations could involve researching and learning about specific disabilities or taking courses in physical therapy. Core courses: Different programs have different core requirements, which all students in the program are required to complete. Look for a program with core courses likely to contribute to your goals in the field. Common core courses in special education include special education assessment and special education practicum. For students looking for a Christian-based online special education degree, Liberty University offers a BS degree track in the field. Categorized as an interdisciplinary studies track, Liberty’s online bachelor’s in special education effectively equips students with the tools to approach a career in special education within the context of a Christian worldview. Although the school takes a faith-based approach, the program does not lack in its attention to modern and contemporary movements and trends in the field of special education, providing students with a comprehensive understanding of the subject area. With a requirement of only 50% of the 45 major hours to be taken through Liberty, transfer students are welcome to finish out their BS in special education in this online program. Though the online BS in special education at Liberty is a non-licensure track, students can opt for a 5th year MAT licensure program that will allow them to enter the teaching field following their completion of the 5th year. Liberty’s nonprofit status allows for some of the lowest tuition rates of many similar online programs, and students may apply for financial aid and scholarships. Tuition payment plans are also available. As the first entirely online program to gain accreditation from the National Council for Accreditation of Teacher Education (NCATE), the BA in special education program at Western Governors University produces graduate students that are highly trained, and well-prepared to enter the teaching field. For those students with some college credit hours already completed, the special education track at WGU can be finished in about two and a half years. For students who have no previously completed hours, the coursework will take about four years, on average. Students at WGU have the power to set their own pace and to take and complete coursework on their own schedules. Since courses are offered asynchronously, students don’t have to worry about being at their computers at a certain time to watch a lecture. A cohort seminar and demonstration teaching are requirements of the program, and these are offered twice a year. Tuition is based on time-to-completion, rather than credit hours, so fees are the same no matter how many credit units a student takes each term—a model that makes WGU especially economical for those students able to move quickly through the coursework. Helping to fill the need for qualified special education teachers in Georgia, the University of Georgia offers its bachelor of science in special education as a two-year online special education degree completion program for students who have amassed at least 60 undergraduate semester credits. Students take all coursework entirely online, but the university requires one visit to the Athens campus for new student orientation. Students also complete three practicums and one student teaching experience within their communities. Prospective students must submit official transcripts from all prior post-secondary institutions that show a cumulative GPA of at least 2.8 and the completion of Core Areas I-VI. Incoming students must also complete an admission assessment by examination or exemption and an educator ethics entry assessment, from which there are no exemptions. The university admits cohorts only once per year in the fall. Georgia residents pay discounted tuition. Central Methodist University allows students to earn their special education degree online through its extended studies program. The bachelor of science in education in special education mild-moderate disabilities K-12 consists of 132 credits that take four years to complete. Although students complete common core classes, they spend most of their studies immersed in education and special education studies. Special education for mid-moderate disabilities courses span 52 credits. Applicants must present a high school diploma or equivalent. In addition, prospective students need to submit official transcripts that show four years of English, three years of mathematics, science, and social studies, and one year of foreign language with a cumulative GPA of at least 2.5. SAT or ACT scores are also required. Transfer applicants must submit official transcripts but need only a cumulative GPA of 2.0. Although the university is located in Missouri, all online students pay the same low per-credit tuition rate. East Carolina University offers an online completion track for students who finish the first two years of their special education program at a North Carolina community college. After completing the first two years of the program, students may transition into the online special education degree program through ECU, made possible through the school’s partnership with the State Employee Credit Union (SECU). Upon taking and passing the Praxis Core tests in reading, writing, and math, students can apply to the Partnership East (PE) program and to ECU. Although the coursework of ECU’s online degree program in special education is based entirely online, students will be required to complete an internship during their final year of study in a public school classroom. Occasionally throughout the course of study, students may also have to observe a public school classroom, prior to entering the full-time internship. To apply to the PE program, students will need to submit transcripts, scores from their Praxis Core tests, and from their ACT or SAT, as well as satisfactory completion of the required coursework at their North Carolina community college of choice. Southern Miss designed its online special education degree for students who already work as special education teacher’s assistants and want to transition to full-time special education teaching. Therefore, the bachelor of science in special education leads to Mississippi special education teaching certification. After taking general core courses and maintaining a cumulative GPA of 2.65 or higher, students spend 63 credit hours immersed in the major, taking both academic courses and conducting student teaching. To apply, candidates need to have a high school diploma or equivalent and provide official transcripts. Southern Miss accepts GPAs higher than 2.0, with the average starting at 2.5. ACT or SAT scores are also required. All education applicants must pass the Basic Technology Literacy Exam, which consists of modules in word processing, spreadsheets, telecommunications, presentation, and database. Online students pay the same tuition rate paid by Mississippi residents. Designed to train special educators to instruct students between the ages of five and 21, University of Wisconsin-Stout’s online special education degree leads to Wisconsin teaching licensure in cross-categorical special education. Students complete the 120-credit bachelor of science in special education curriculum entirely online, with no on-campus residency requirements. However, the program does require on-site student teaching. The four-year program includes 44 credits of general education classes, but students spend nearly two-thirds of the program, or 76 credits, immersed in the special education major. Applicants must hold a high school diploma or its equivalent and need to submit official transcripts. The university requires applicants to have taken four years of English, three years of mathematics, science, and social science, and four years of electives. ACT or SAT scores are also required. Transfer applicants must submit all official transcripts and need to have a college GPA of at least 2.75. Wisconsin residents pay the cheapest tuition, while Minnesota residents receive a discount. The Bachelor of Science in Education (B.S.Ed.) with a major in Special Education prepares candidates for initial teacher certification in grades pre-kindergarten through 12. The program has two tracks from which to choose: General Curriculum, which teaches students with mild disabilities who receive instruction using the general education curriculum and who participate in the general statewide assessment, or Adapted Curriculum: teach students who have moderate or severe disabilities who may participate in an alternative assessment. Teacher candidates are also prepared to teach students in special education preschool settings (ages three to five years). Specific categories of mild disabilities include learning disabilities, emotional and behavioral disorders, other health impairments, and mild intellectual disability. Specific categories of moderate to severe disabilities may include autism, moderate or severe intellectual disabilities, or multiple disabilities. A full year of field experiences in public schools occurs throughout the professional education courses. Candidates in this program will also acquire a concentration in reading through the completion of courses that are integrated into the professional course sequence. Courses are offered in flexible modes and sequences. Courses are designed to meet the needs of traditional and non-traditional students. Field experiences must be completed in accredited public schools in the state of Georgia. In addition to maintaining a campus in Madison, South Dakota, Dakota State University offers convenient, online programs for many degree tracks. The school's BSE degree program offers a track in elementary and special education that prepares students for jobs in special education, particularly in teaching in the K-8 or K-12 area. Student teaching experience in two different areas (primary, middle, or secondary) will allow students in the program to see what areas they excel in, and make a more informed decision about their ultimate career paths. Since the same professors who teach on-campus courses also teach the school's online courses, students in the school's online special education degree program at DSU benefit from the same breadth of knowledge and attention that on-campus students receive. Since many online courses are taught synchronously with on-campus courses, online students have the opportunity to collaborate and work with on-campus students in ways not offered by many other online degree programs. DSU’s innovative use of classroom technology also prepares students to work in today’s modern classroom. The degree includes a built-in K-12 education technology endorsement. Colorado Christian University students can earn their special education degree online, with or without licensure. Students take either the bachelor of arts: liberal arts with special education generalist licensing or the bachelor of arts: liberal arts with special education generalist theory program. Aside from licensure, the primary difference between the programs is the credit distribution. While both consist of 120 credits, the licensure program requires students to take 48 credits of special education core classes and fewer credits of electives. In contrast, the generalist theory program requires only 37 credits of special education core courses and allows for 35 credits of electives. Prospective students must have a high school diploma or its equivalent and need to submit official transcripts that show a cumulative GPA of at least 2.8. The university also requires ACT or SAT scores. In addition, applicants need to submit a personal essay and a recommendation letter from a spiritual advisor. All students pay the same per-credit tuition rate. The University of West Alabama offers an online special education degree that requires students to attend some on-campus seminars. Students must also complete the curriculum’s student teaching requirements in an Alabama-approved school. The university designed its bachelor of science in collaborative teacher/special education K-6/6-12 program for working instructional aides who wish to earn a four-year degree and obtain a special education Class B certification. Students take 128 credit hours, 63 in general core and education, 28 in professional education, and 37 in student field teaching. Although designed as a four-year degree, some students complete coursework within three years. Applicants must first apply to the university and complete the general core requirements with a cumulative GPA of 2.75. Candidates can file their applications to the program only after they complete a Praxis Core Academic Skills Test. Candidates go through three interviews with faculty before the university makes a program admission decision. The Paraprofessional Pathways program at Fontbonne University offers an opportunity for current teaching assistants and paraprofessionals in educational settings to gain their teaching certification and a BS in special education. Graduates of this exceptional program gain certification in K-12 mild/moderate cross-categorical.This unique and innovative online special education degree program allows students to stay with their jobs and continue working even as they work towards completing their coursework and certification. Students in the Pathways program will take just two 16-week online courses during the fall and spring terms, and two eight-week online courses during the summer term. Depending on the individual policies of the student’s district, the program's required clinical experiences may be completed through the student’s current paraprofessional job. Fontbonne University online special education degree program boasts an impressive 96% career outcome rate for graduates, and all students have access to more than 10 free career services offered through Fontbonne. Located in Oklahoma, Northeastern State University’s bachelor of science in education in special education with a major in mild/moderate disorders consists of 141 credit hours. Setting itself apart from other online schools for special education, NSU takes a 4x12 approach to education courses, meaning that students take 12 credits of courses in each of the four foundational areas of K-12 education: English, mathematics, science, and social studies. The curriculum features 35 credit hours of instruction in mild or moderate disorders. Students must maintain a cumulative GPA of 2.75 in order to graduate. Prospective students must have earned a high school diploma or equivalent and need to submit official transcripts and ACT or SAT scores. Ideal candidates possess a cumulative high school GPA of 2.7 or higher, but the university accepts higher ACT or SAT scores as a substitute for GPAs that do not meet this threshold. The University of South Carolina-Aiken offers a special education degree online as part of a degree completion program. Students who wish to earn the bachelor of arts in special education must first complete at least 45 credit hours in South Carolina’s Palmetto College system or at another institution. Degree completion requires a total of 126-129 credit hours, which USC Aiken students earn in two years of full-time study. Through academic courses and on-site student teaching, the curriculum prepares graduates to work as special education teachers in K-12 classrooms. Applicants typically have 60 college credits that they have accumulated through two years of community college study. The only application requirement is the submission of official transcripts that display a GPA of at least 2.75. After making admission decisions, the university contacts the applicant to provide notification of how many credits will transfer into the bachelor’s program. South Carolina residents pay discounted tuition. The limited-residency programs at Prescott College are innovative in their combination of online and on-campus learning. Prescott offers students a rich, exciting way to take control of their education. Students in the school's limited residency BA in education and teacher preparation program learn in their own communities, as well as through online-based curriculum under the supervision of vetted and endorsed mentor faculty members. Through this degree program, students work toward certification in special education, as well as elementary, secondary, and early childhood special education. Prescott's online special education degree programs offer various post-degree teaching certificates for students looking to add more value to their resume and skill set. Once students are paired with a mentor, they may collaborate and meet virtually or on-site. Coupled with online coursework, the school's mentor program fosters a one-on-one, face-to-face element that most other online programs lack. New Student Orientation is required of all students, and financial aid is available for qualifying students. There are no one-size-fits-all academic programs. Programs differ by school. Each program has specific requirements and policies, but the chart below lists common concentrations within special education programs. Not all schools offer the same concentration options or curricula. Each school provides a unique set of coursework. Below are common courses in special education degree programs. Special education assessment: This course teaches appropriate and effective methods for assessing the academic progress of students with disabilities. These methods are often learned alongside those for a general classroom. Early childhood disabilities: This course explores disabilities some experience during early childhood and how teachers can effectively work with these students. Coursework delves into how these disabilities affect children emotionally, mentally, and physically. Foundations of teaching: A degree in special education is, above all, an education degree. This course provides the necessary background for studying education. HOW LONG DOES IT TAKE TO GET AN ONLINE BACHELOR'S IN SPECIAL EDUCATION? Most online degrees in special education require about 120 credit hours, though there is some variation among programs. Cohort-based programs may require more time to complete, as students work through the coursework in groups. On the other hand, the flexibility of individually-paced programs allows students to complete coursework according to personalized timelines. A 120-credit bachelor's degree generally requires two to four years to complete, depending on pace, course load per semester, and specific program requirements. Board Certification in Special Education: Offered through the American Academy of Special Education Professionals, this certification shows commitment and excellence, representing high qualifications in the special education field. The certification requires a master's degree. State Teaching Licensure: An online degree in special education prepares students to seek state licensure. Since each state has different licensure requirements, check with your state's department of education to ensure you are on the path to licensure. In choosing the best online degree in special education for you, consider each potential program's accreditation. Most schools are regionally accredited, and some may be nationally accredited. The Higher Learning Commission gives regional accreditation to schools that meet its criteria. When it comes to programs in special education, the National Council for Accreditation of Teacher Education is one of the top accrediting organizations. The U.S. Department of Education handles policies in United States school systems. This agency also provides aid and assistance to students; you will submit your Free Application for Federal Student Aid (FAFSA) each year to receive financial aid. The U.S. Department of Education and the Council for Higher Education Accreditation both provide comprehensive lists of their accredited post-secondary schools. Check their websites to find the best online degrees in special education. A career in special education is ideal for those with a great deal of patience and adaptability. While working in the special education field can be stressful, it is highly rewarding and fulfilling. From careers in art therapy to early intervention, graduates with a bachelor's degree in special education have a wide range of opportunities. Preschool special education teachers work with young children who have not yet entered kindergarten. Special education preschool teachers teach children basic life skills and adapted versions of the normal preschool curriculum. Kindergarten and elementary school special education teachers help students acquire basic academic and life skills necessary to progress through primary and secondary education. Middle school and high school special education teachers help students establish and maintain life skills, while delivering the appropriate academic curriculum. Social workers positioned inside schools focus on students' wellbeing and intervene when issues arise. A social worker with a background in special education is exceptionally equipped to handle these kinds of interventions. Beyond the bachelor's degree in special education, graduate and vocational paths are available to those interested in continuing their education. For example, occupational therapists are often needed in special education classrooms to help disabled students with daily activities. With a master's degree, a certified occupational therapist can earn a higher salary than a teacher with a bachelor's degree. A bachelor's degree in special education prepares students for the wide range of career options available within the special education field. A bachelor's degree, paired with professional experience, earns special education professionals salaries that grow throughout their careers. Professional organizations in special education help graduates network and find job opportunities. A number of nationally and internationally recognized organizations provide important services and opportunities for their members, most with minimal or no membership fees. This organization assists those preparing for careers in special education, as well as those already working in the field. The CEC uses professional development and advocacy to achieve excellence among special education professionals and to improve the educational environment for disabled students. This umbrella organization covers many different agendas, including special education programs. Their overall mission is to advocate for and to continually improve public education. Undergraduate students have a myriad of funding opportunities, such as loans, scholarships, and grants. Always fill out the FAFSA, after which your school will provide you with individualized funding opportunities. Special education students may pursue opportunities for extra federal funding through the TEACH Grant, and some states offer discounted tuition rates and waivers for those studying to become special education teachers.